Military generals in the Trump White house are making a killing, at least in terms of their pension benefits and salaries. Trump thinks that generals and other senior military officers are great at organizing chaotic situations or instilling discipline into errant civilians and others with minimal workplace experience. Yet while there is a disconnect between this attempt at instilling military-inspired discipline, organization and even basic competence into Trump’s former campaign workers and others working in the White House, Trump’s generals are taking home huge pensions, combined with their new White House salaries that should make them the envy of non-commissioned soldiers and almost all civilians. Thanks to a 2007 legislation passed by a fawning Congress, a Pentagon-sponsored proposal raised retirement benefits for three- and four-star admirals and generals that let them to make more in retirement than they did while serving on active duty. Private Benjamin could do a better job in the White House. A USA Today story found that a four-star officer retiring with 40 years of experience would receive an annual pension of $237,144, according to the Pentagon. Base pay for active-duty top officers is $181,501 a year. Housing and other allowances can boost their compensation by an additional one-third or about $60,000 per year. ...a four-star officer retiring with 40 years of experience would receive an annual pension of $237,144, plus health benefits. After 20 years of service, regardless of age, a military retiree qualifies for a pension amounting to 50% of final pay with an additional 2.5 percentage points for each year of service beyond 20. Plus, the officers get a cost-of-living adjustment for their pensions, a benefit that is not widely offered in the private sector. Plus, the generals, like other qualified military of all ranks, get medical benefits (essentially free health care from TRICARE) for themselves and their families. These generous benefits are being given at a time that the general civilian population faces a retirement crisis accompanied by impending cuts in Social Security, Medicare and Medicaid. But in the Trump White House, the generals have found a great place to offer their military training on Trump, who only went to military school and evaded the draft by claiming he had bone spurs. While we don’t know what Trump’s generals think about reporting to a boss who is a draft dodger, we do know they are being well compensated for their efforts to turn the White House into a finely-tuned military machine. 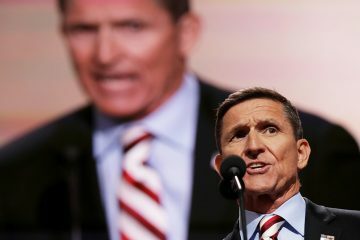 retired Lt. Gen. Michael Flynn who spoke at the Republican convention and lead the crowd in the “lock her up” Hillary Clinton chant for some hypothetical and unspecified crimes. In addition, Attorney General Jeff Sessions named retired Maj. Gen Mark S. Inch to lead the Federal Bureau of Prisons. Inch has 35 years of military experience. Trump also appointed retired Lt. Gen. Keith Kellogg, executive secretary and chief of staff for the National Security Council, assistant to the president, whose salary is $179,700 a year, plus pension benefits. In addition to their generous pensions, Kelly pulls in an additional $179,900 per year as chief of staff, while McMaster makes $172,200 annually. But that’s not all. In addition to their military pensions, the generals are also eligible for a smaller pension (based on years of service outside the military) from the Federal Employees Retirement System. The result of “brass creep” is “making routine authorizations complex procedures.” It is also very expensive to taxpayers. Like any bureaucracy, the Department of Defense cannot reduce itself. It is too political, has vast historical inertia powered an unquestioning following among many veterans that all wars are justified and the DOD is sacrosanct. So with so many top officers in very visible positions in a White House that is clearly on the defensive, it looks like the glut of generals still cannot make good offensive maneuvers to save their commander-in-chief. All this is bad PR for the military. It shows the public that some generals came out of retirement to promote very conservative, some say reactionary, blindly pro-military ideology that is more akin to a Third World country than the nation that is paying them such generous benefits. Originally it was thought the generals could baby sit a clearly unstable rich guy, but this may have been a job better suited for Private Benjamin or Sergeant Bilko. 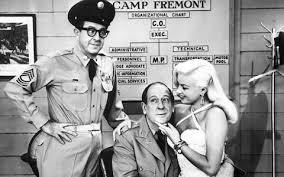 At least Bilko could have been on the same conniving wave-length as Trump, but Sergeant Bilko had a good heart. Trump clearly does not. And that is where Trump’s generals made a bad mistake. If they admired Group Captain Lionel Mandrake (right) in the film, Doctor Strangelove, they picked the right men. But if the Pentagon wants a better public image, they should have ordered the generals into just retiring to the closest officer’s club to collect their pensions and benefits. Maybe they can’t stand the truth, but if they went quietly into retirement, the nation would have be better served.